Chooks are fabulous but fickle creatures. 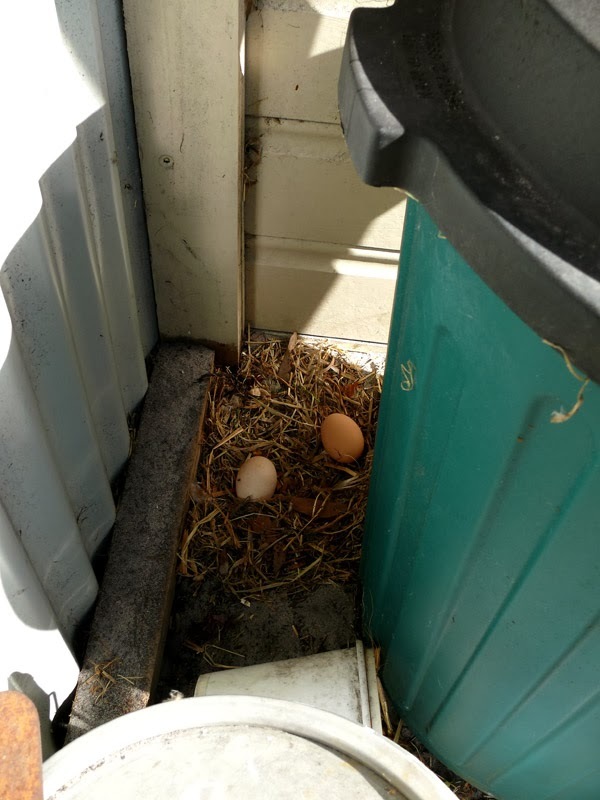 Our egg production tailed off rather suddenly last week which was rather mysterious. 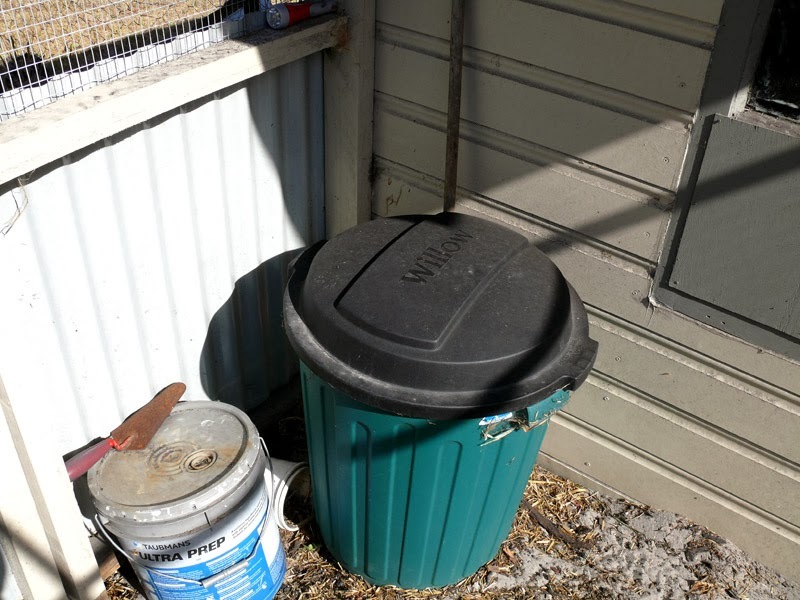 Then I noticed Wilma on a few occasions disappearing behind this feed bin in the corner of their yard. And look what I found. A cute little nest had been made in the corner for a lovely private nesting area. Something must have upset a couple of them as this happened for quite a few days. In the end I nailed an extra piece of wood across the top of their nesting boxes, to make them more private, and after a day of getting used to this, laying has once again been happening in the right place. Weirdos. We had the pleasure of the company of our friends Angie and Andy for a couple of days. 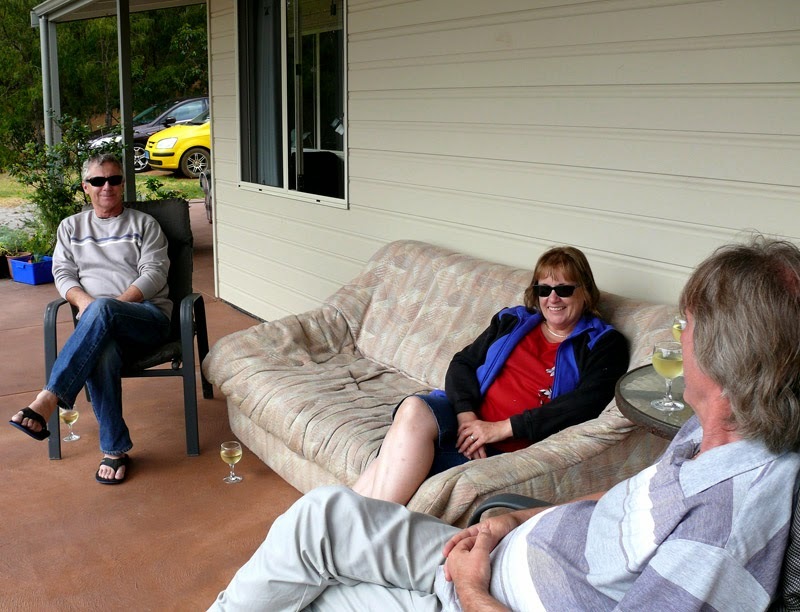 Drinkiepoos on the verandah is happening here, and catching up on all the news. 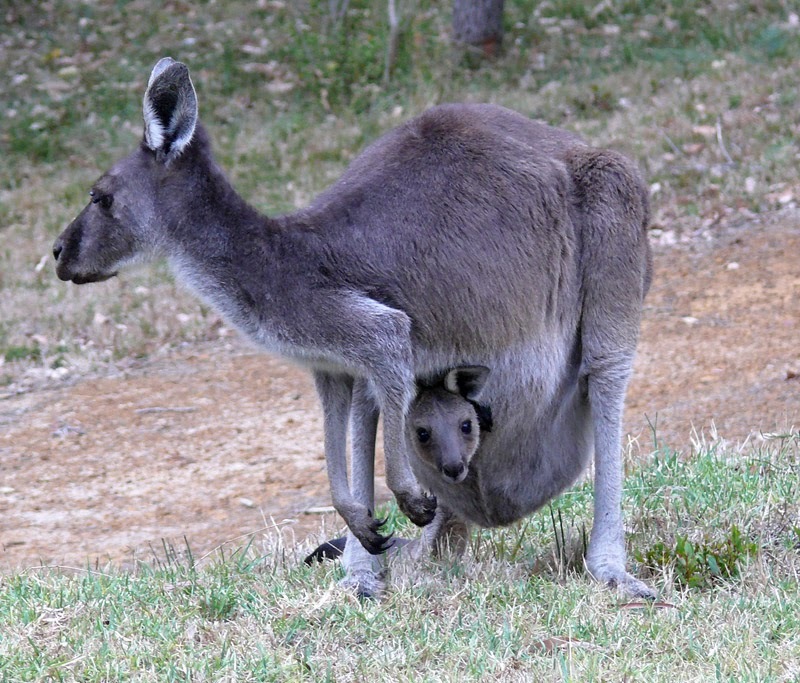 Now isn't this the cutest little joey you ever did see? Its name is Lucky. Reason? Angie and I watched in complete astonishment as a wedgetail eagle had a go at the joey as it had a little bounce around out of the pouch, it swooped down a couple of times to a couple of metres above the joey, who had the sense finally to leap back into mum's pouch. Whether the eagle would have actually attacked the joey I am not sure, but if the joey (who is still a small, gangly little thing) strayed too far from mum and the rest of the roo group, then perhaps yes. 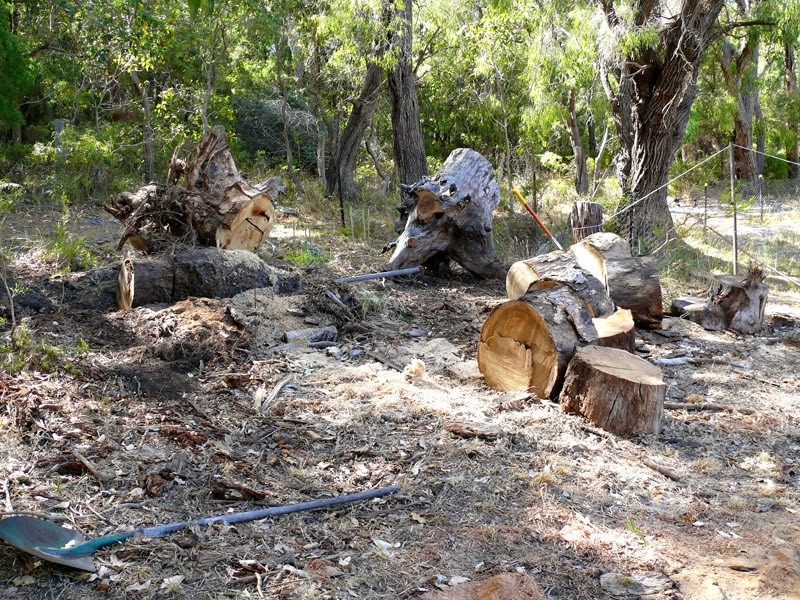 Steve has been a busy lad continuing on with clearing up the site of the huge tree trunks, he's doing a great job. 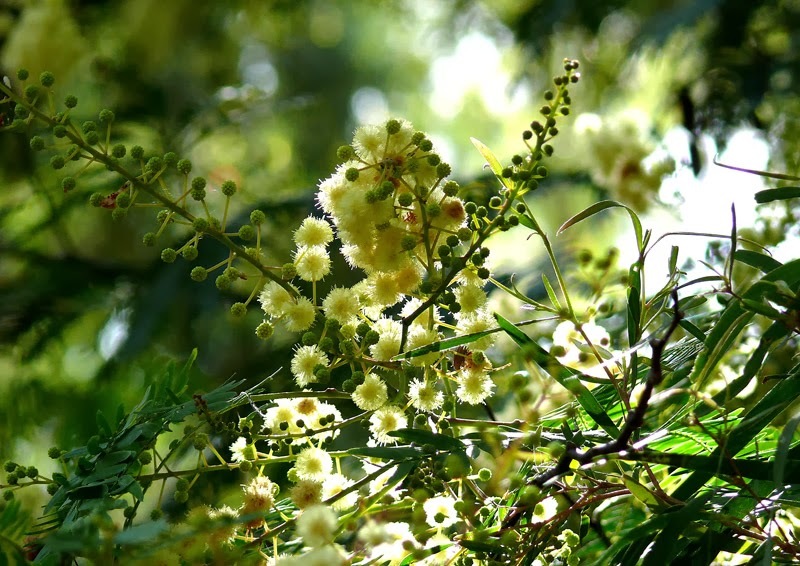 The big wattle trees are flowering now, I think they might be called Karri Wattles. We only have a couple on our place but they are huge and very beautiful. The bees love them! 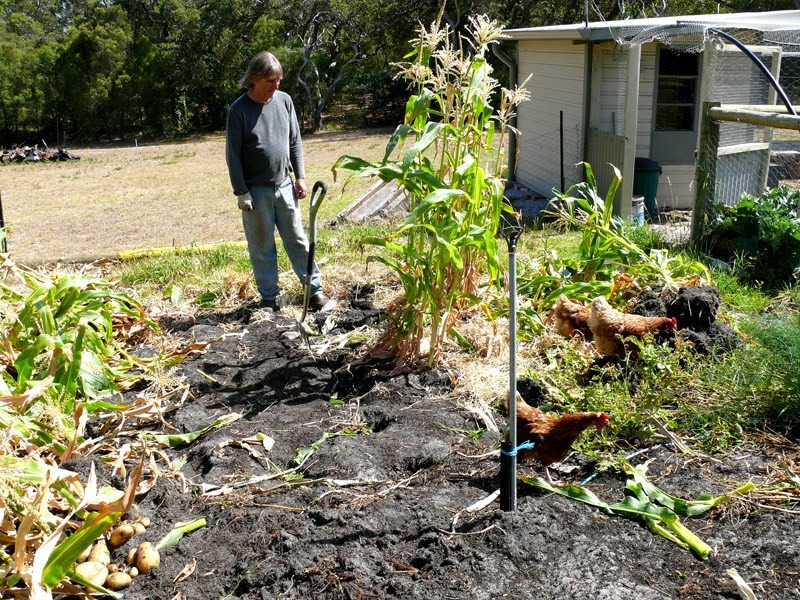 Yesterday we decided to harvest the rest of the sweetcorn and pull the plants out. We have already eaten heaps of delicious corn and there are bags of it in the freezer for later, but the remaining corn needed to be picked or else it gets overdone and loses its sweetness. 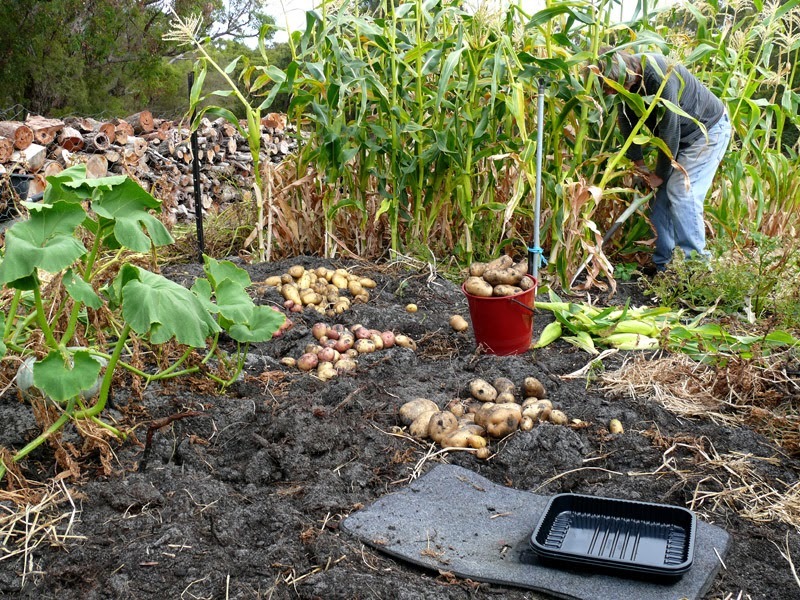 We also decided to dig a heap of potatoes too. 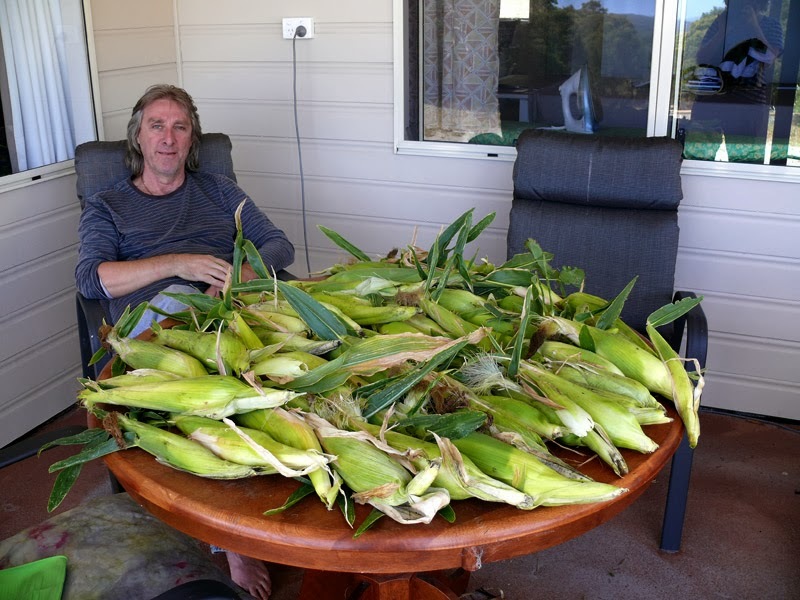 A nice haul of corn. After dealing with all this today, in the freezer we have 4 kilos of corn that has been stripped off the cob, plus a few dozen whole cobs and half cobs. Yay. 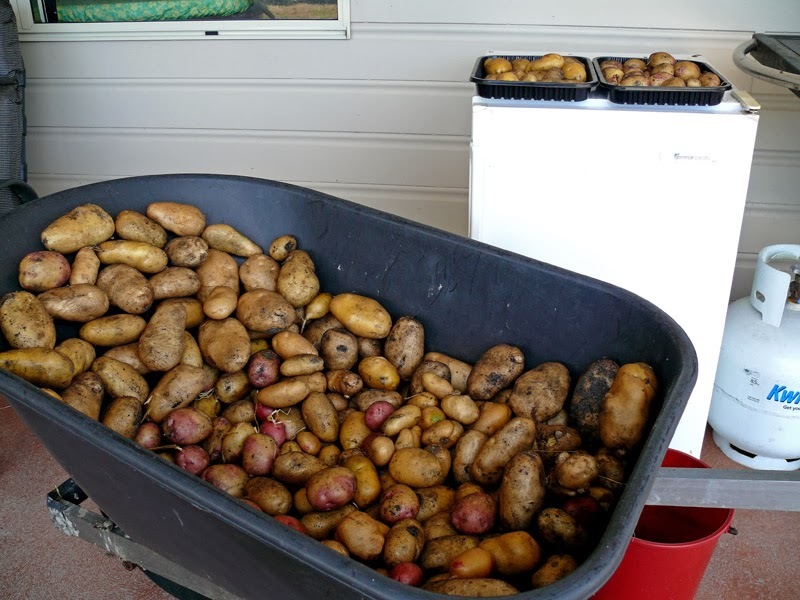 Woohoo, 35 kilos of potatoes! 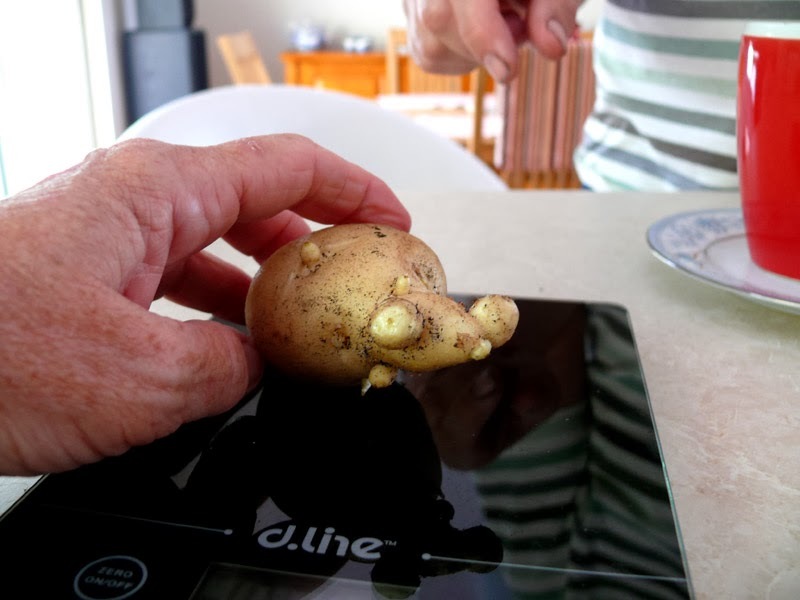 That is on top of the 30 kilos we have already picked over the last 6 weeks. And we still have a quarter of the potato bed to pick. We are going to have a go at cutting some up into chips and wedges, par frying them and freezing them. I must go. As much as I would like to get back into my book (Cecelia Ahern - There's No Place Like Here, I'm enjoying it), first I have to change the sheet on our bed. You know how when sheets get old they get gloriously soft but also thin? I put such a sheet on our bed the other day, so soft and comfy. But thin. With a tiny little tear in the middle of it. Such a teeny tiny tear, it will be okay I thought, I'll get a few more uses from this comfy, soft sheet. Well. Within an hour Steve had put his foot through the teeny weeny tiny tear and later in the night I felt my own foot do the same thing. I should have changed the sheet the next day but I persevered for another two days, you know, just to give it a chance to magically knit back together overnight. I kept sort of tucking the tears under a fold to keep them safe. Hah! By today the sheet looks like someone has attacked it with a machete. Very crossly. So, I shall sadly condemn my favourite sheet to the rag pile.